The Lilac Scrapbook: "Body Shaming"
This is something I've wanted to get off my chest for ages and now seems as good a time as any. It's becoming more and more common in the media to promote 'curvy' as beautiful, instead of the skinny girls we are used to seeing on the catwalk. It's all well and good to promote a healthy lifestyle and to tell girls and women to be happy with their body even if they're not a size 6 like those we see in magazines - however it has to be done right. It seems to have got to a stage where curvy or "normal" (what is normal, anyway???) is being portrayed as better than being skinny, and that's wrong. The media is now making girls who are naturally skinny feel victimised in the way that girls who are on the curvier side once felt. It's like a see-saw, and a balance hasn't been reached. What the media ought to be promoting is that it is perfectly okay and wonderful to be whatever size you want to be, as long as you are happy and genuinely healthy. 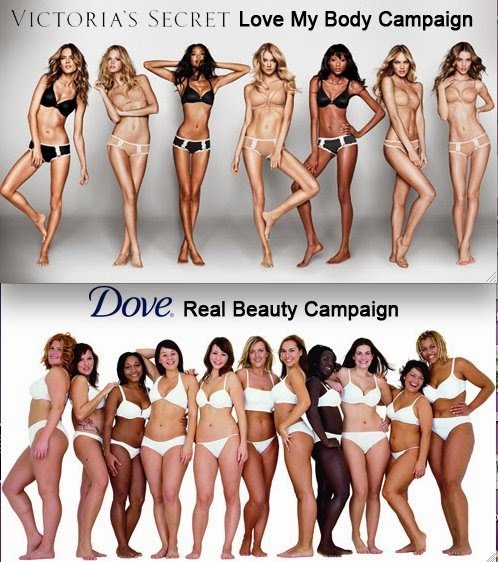 Take for example, these two campaigns: one by Victoria's Secret, and one by Dove. The VS campaign shoes seven skinny girls, while the Dove campaign shows a number of curvy girls in a range of colours and sizes - however, none of the girls in the Dove campaign are skinny. And whether the girls in the VS campaign are naturally skinny, photoshopped or whatever - that doesn't escape the fact that the Dove campaign is sending the message that skinny isn't "real beauty". And in my opinion, that's unfair to the girls with fast metabolisms who are skinny but still healthy; they can't help being the size they are, just as curvier girls can't always help being curvy. Similarly, though, campaigns like the VS one which have been around for donkeys years, do make bigger girls feel insecure. While I may not have written this in the most articulate way, I hope my message is making sense: companies need to portray beauty from all angles, not just one. What started as an innocent way to make curvy girls (like myself) feel better, has turned into something which completely victimises skinnier girls. The media is, as always, unfair.